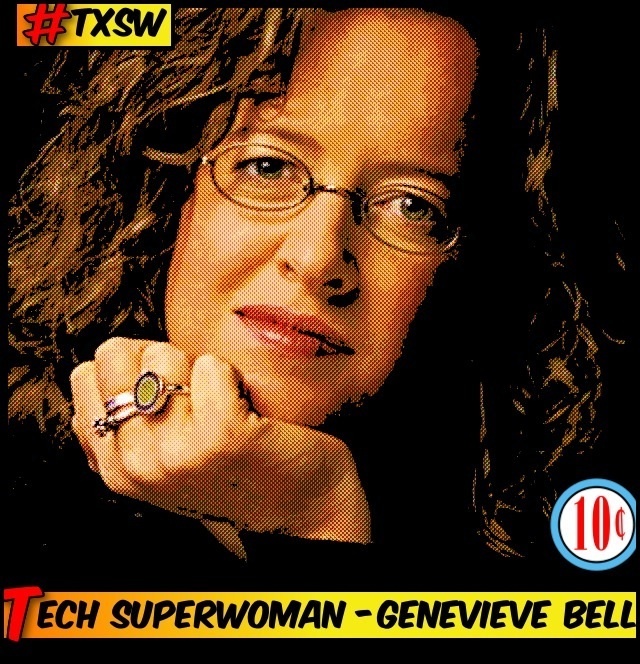 I am honored to feature a true global citizen, technologist and scholar in the Tech By Superwomen profile series – Genevieve Bell. Genevieve’s advice to the #TXSW community? Cultivate an attitude of openness, embrace transitions and risk rejection – it’s the only way to grow. Dr. Genevieve Bell is an Australian-born anthropologist and researcher. As director of User Interaction and Experience in Intel Labs, Bell leads a research team of social scientists, interaction designers, human factors engineers and computer scientists. Australian grooves are always running through her head. “Well behaved women rarely make history” – she wears it on a bracelet around her wrist every day. As a tech professional woman charting your own path, what can you share about transitions? What do they teach us? For me, transitions are important for two reasons. First, they offer us the moments to catch up with ourselves and what we have accomplished and to reset our own self-image and how we think about selves and what we can do. Until you are clear about that, I think it is hard to get others to engage with you in the right ways. Second, transitions allow us these moments to re-imagine ourselves and see other potentials, possibilities and pathways. I always find that quite liberating. What advice would you give to women just starting in your field? To women already established? I think it is the same advice, in some ways, and it is to say “yes” to everything. Not literally, well perhaps literally. But certainly in the sense that I think you need to be open to as many different kinds of experiences, and opportunities as possible. Sure, we need to think about all the different competing demands and pressures and it isn’t realistic to say yes to everything but I think there is real value in staying open to new things and new possibilities. What’s your reach this year, and how can this community assist you? The usual – I want to change the world. Who is your favorite mentor? In my time at Intel, I have had two amazing mentors: Craig Barrett and Louis Burns – very different men, with very different personalities and points of view. What difference did that make in your life / career? They both pushed me further than anyone else was at that time, they saw things in me I didn’t and I was always grateful for the hard questions they asked, and that they didn’t let me cop out. They both would give me the unvarnished truth – it was very Australian. And they aren’t, but it worked anyway. What’s been the biggest challenge in finding a mentor or someone to mentor? I think the biggest challenge is being willing to ask someone, to make yourself vulnerable to them saying “no.” I think the other piece is being able to really find someone who can push you and see more in you than you can see in yourself. This process can be uncomfortable, but it’s the only way you grow. What’s your take on the state of diversity and women in tech? Look around any conference, boardroom, or cafeteria and you know the answer to that. We need more diversity of all sorts – age, ethnicity, life experience, gender, education. And it is something we all need to engage with – not just women actually, but everyone. And I know it sounds simplistic, but we all do benefit when there are more voices and more points of view in the room, rather than less.